Jonathan Irwin stars as Freak/Eric Harris in a cast of eight. UPDATE: After a shooter killed a 2018 Cal Lutheran alumnus and 11 others at a Thousand Oaks club where many students were in attendance on Nov. 7, a single invitation-only performance attended by about 160 people was performed on Nov. 17 instead of the previously scheduled public shows. (THOUSAND OAKS, Calif. – Oct. 29, 2018) With school shootings on the minds of today’s youth, California Lutheran University students are presenting a play sparked by the 1999 Columbine High School massacre in Colorado. “Columbinus” will begin at 8 p.m. Thursdays through Saturdays, Nov. 8 through 17, and 2 p.m. Sunday, Nov. 18, in Preus-Brandt Forum on the Thousand Oaks campus. The director, cast members, and Cal Lutheran psychology or criminal justice faculty will participate in informal discussions with the audience after each show. With the United States averaging one school shooting a week and students across the country rallying together in a call for action, faculty members in the Theatre and Dance Department decided to stage a play that addressed the issue. Although the Columbine shooting happened nearly 20 years ago, before some of the cast and crew were born, the play feels current, director Brett Elliott said. Students involved in “columbinus” watched documentaries on the tragedy, researched the shooters’ mental health problems and learned how the shooting changed high school culture. 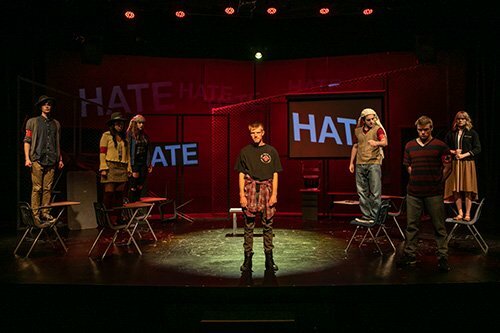 The intensity of the production, which features hate speech and graphic descriptions of violence, deterred a couple of students from participating, but those involved feel the play has an important message. The cast features Clayton Currie of Ventura, Jordan Erickson of Thousand Oaks, Jonathan Irwin of Washington, Victoria Karr of Corona, Amber Marroquin of Costa Mesa, Mahyar Mirzazadeh and Gabrielle Reublin of Thousand Oaks, and Jacob White of Palmdale. The Cal Lutheran production has an original score by Christopher Hoag that incorporates covers of pop music from the late 1990s along with video projections. The forum is located at 135 Chapel Lane. Admission is $10. Tickets are available at CalLutheran.edu/theater and at the door. For more information,call 805-493-3452.